The Moen company produces many different faucet designs for sinks and showers. Many of these designs use handle hubs, which are essentially decorative pieces by which the faucet's lever handle attaches to. Unlike other faucet designs, whereby the faucet valve can be accessed by simply removing the handle, these designs require the lever handle and the hub to be removed. Thankfully, doing so is a fairly simple task, as both the lever handle and the handle hub are only hand tightened onto the faucet assembly. Whether removing a Moen handle hub from a sink or shower faucet assembly, it is necessary to first turn off the water supply. This is because the handle hub must be twisted in a counterclockwise direction to be removed, which is the same direction used to turn the faucet on. If removing the hub from a sink, the water supply can be turned off at the water supply valves located underneath the sink. There are two water supply lines, each with an integral handle. Turn both handles in a clockwise direction to turn off the sink's water supply. If removing the handle on a shower assembly, the water supply must be turned off at the main shutoff valve. The valve is located next to the water meter at the exterior of the structure, and must be twisted in a clockwise direction. Moen's handle hub features a lever handle that screws into the side of the hub itself. To remove the lever handle, simply twist the handle in a counterclockwise direction. Some Moen handles feature a colored ring that fits between the seam of the lever handle and the handle hub. 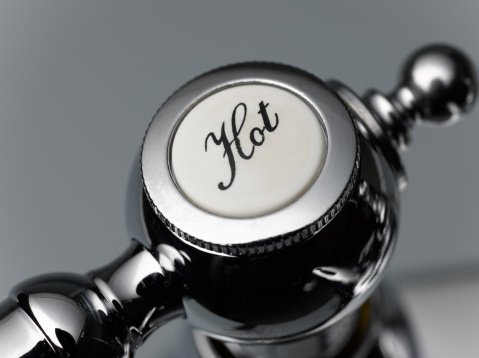 A red ring is used to denote the hot water handle, while a black ring indicates that the handle controls the flow of cold water. When the lever handle is removed from the hub, this ring will be loose, so take care not to loose it. The lever handle is hand tightened into the handle hub, the handle hub is hand tightened onto the faucet assembly. To remove the hub, simply twist the hub in a counterclockwise direction until it can be lifted off of the faucet assembly.